We receive many different requests regarding email hosting, from people being plagued by inordinate amounts of SPAM to businesses requiring professional email addresses. We can guide you through the process of selecting the right service for your business and give you advice on working with mobile devices and accessing your emails wherever you are in the world. Our tech experts will set-up, install and configure your email client on your PC if needed. 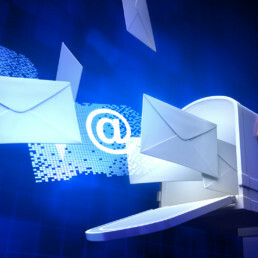 We will customize your e-mail settings and enable multiple e-mail account configurations. We will also ensure total protection from various types of spam, virus and other malicious malware. Tech support for troubleshooting e-mail issues for one-flat-rate. Set-up, install, and configure e-mail clients and software. Fix errors in e-mail clients and upgrade the Latest versions. Skilled technicians for all troubleshooting e-mail issues.